Well most of you all know what shimming is, if not just search, plenty of answers as to what it is.... although, not many answers or guides on how to do it correctly, so here is a guide on how to shim like a true mechanic. A lot of people will tell you to start with the spur gear, that is not correct. There is no mechanical application on the planet earth in which you start shimming in the middle and I can't fathom why anyone would. You always want to start on one side and finish on the end, you don't want to start in the middle then get caught up going back and forth between gears. You always want a nice and clean start to finish in your shim job. Do this correctly and your gun will not only function, it will function like it is suppose to. I'm going to try to make this as simple, easy and quick as possible for you guys. 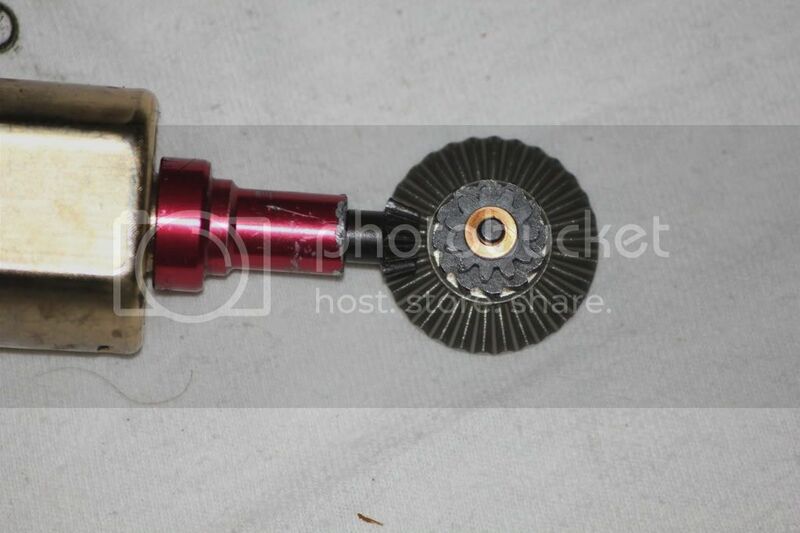 First, take the pistol grip with the motor and the end cap, then screw it onto the top half of your gearbox shell with only the bevel gear installed. If you have a v3, v6 etc. just screw on the motor and motor cage. 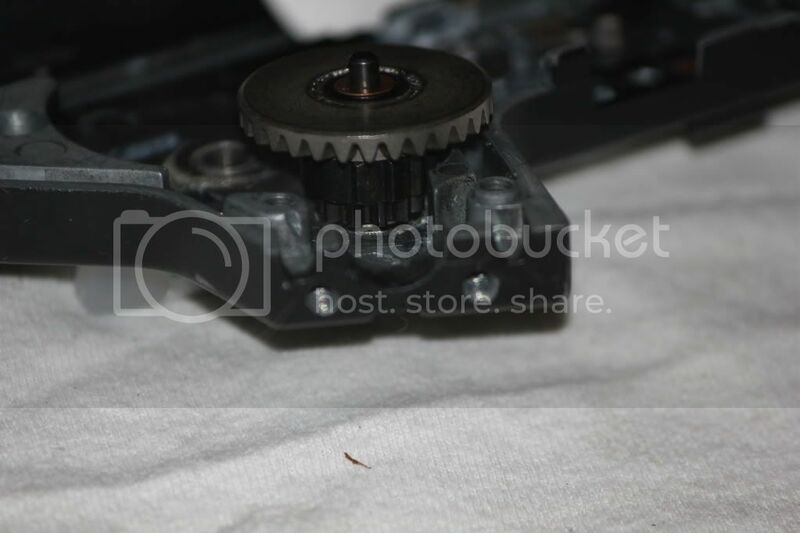 Adjust the motor hight so the pinion gear makes full contact with the bevel gear just like this (obviously it would be inside the gearbox, but this is just so you get a good view of the what it should look like). Then, place enough shims of the top face of the bevel gear so that it has enough clearance to avoid grinding against the gearbox shell and meshes well with the pinion gear. The bevel and pinion should be making as much contact as possible without hindering the movement or causing to much pressure. Now that the bevel gear and pinion gear are aligned and meshing properly, you can remove the motor and pistol grip or motor cage. Now place enough shims on the bottom of the bevel gear so it prevents the bevel gear from riding to low. Screw the gearbox shell together and test the movement of the bevel gear. If shims need to be removed or added, do so to the bottom of the bevel gear, not the top face. If you alter the shims on the top face it will effect the way the pinion gear meshes with the bevel gear. Next you install the spur gear. Put enough shims on the bottom of the spur so it has just enough clearance so it doesn't grind against the face of the gearbox shell, the anti reversal latch notches on the bevel gear, and also the bevel gear's bushing or bearing. Then put enough shims on the top of the spur gear to prevent it from riding up. Screw the gearbox shell together and test the movement. 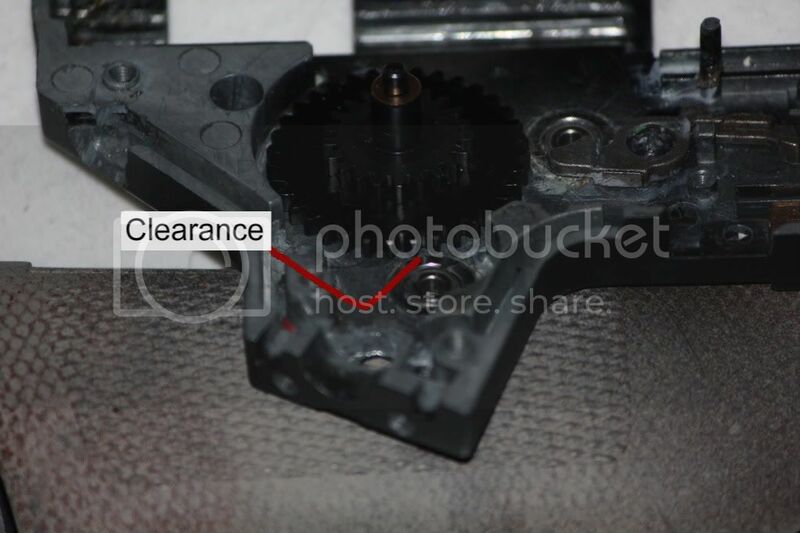 Add or remove shims from the top of the spur gear if need be. 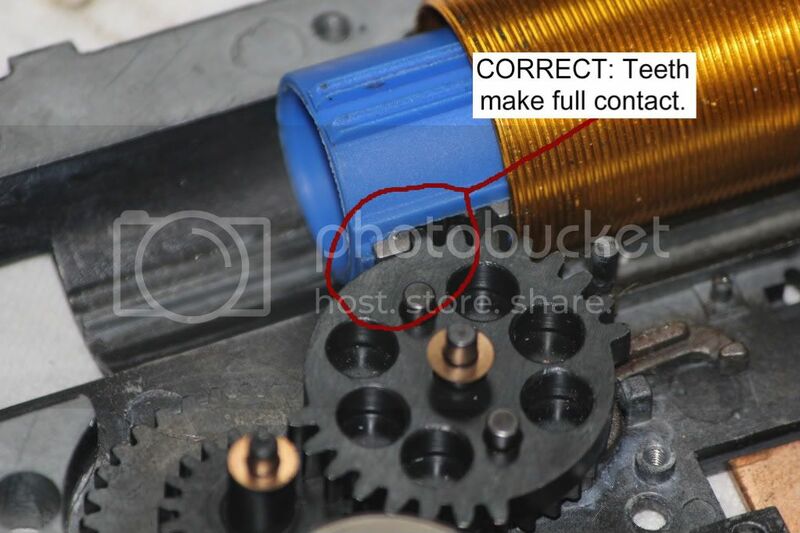 Then install the sector gear with enough shims on the bottom so it has enough clearance from the spur gear and cutoff leaver, and also makes as much contact as possible with the teeth on the piston. This is wrong. The teeth are not fully contacting each other. This is correct. The teeth are fully contacting each other. Then put shims on the top of the sector gear to prevent it from riding up. Screw the gearbox shell together and test the movement. 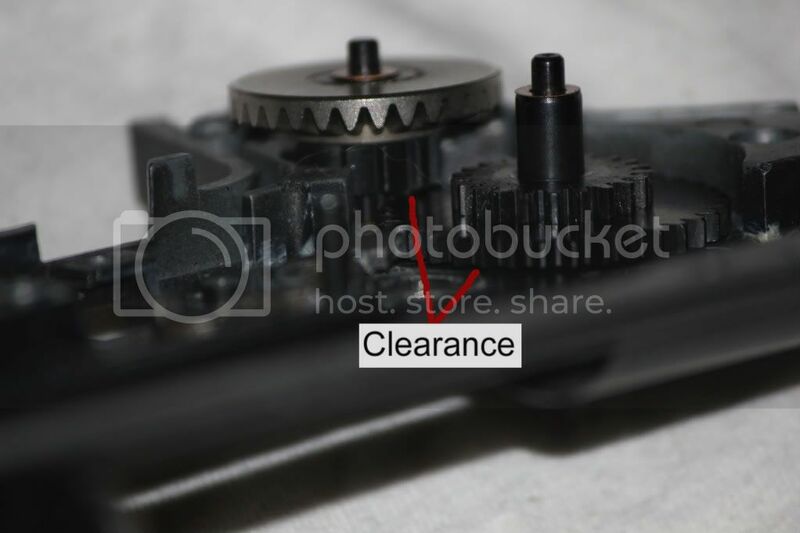 Add or remove shims from the top of the sector gear if need be. All the gears should have as little play as possible, yet spin freely and without hesitation. I take my time shimming, and I shim gears to the point where they don't move side to side at all, so you may mistake them for being to tight considering you cannot feel them move from side to side, however they spin incredibly well when you move them and you can't even hear them spinning. That's the kind of precision and high tolorances you want, so take your time a get it right. Now this is the tutorial I was waiting for, mate! Great guide, very helpful. Nice setup, if you don't mind me asking what shell and motor are you running? Great guide Age! Simple, concise, and too the point. The pictures are excellent too! Funny that you put this up, I just reshimed my gun yesterday. Thats a really good idea with the bevel and pinion gear. 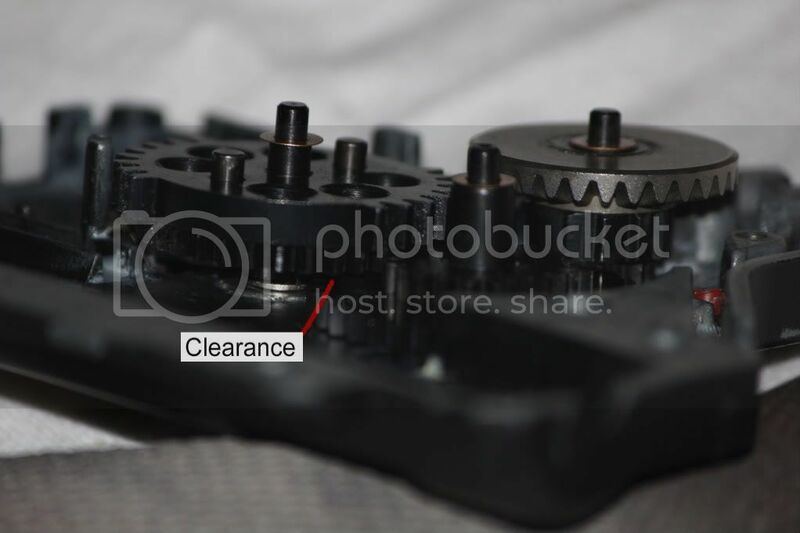 I have always shimmed with the bevel first, but shouldnt you shim the spur gear a little higher than minimum? To maxamize contact with the high bevel. Excellent guide, Age, Well done. Added to the Miscellaneous Internal Tweaks thread. Matrix magnum with a new pinion (not sure what pinion), ACTION 9mm gearbox and RiotSC GSR's....Just some spare parts I had laying around. It's just the camera angle. The teeth are making full contact. That guy. You know. The one with the face. This guide has already been added to the Miscellaneous Internal Tweaks Thread, which is a pinned thread linking you to every internal guide made on ASF. So in essence this does not need to be pinned (while there's nothing wrong with pinning this, it's just a tad redundant). I didn't mean in your case, you stated that you should shim the spur high enough to avoid contact with the bushing/bearing. What if you have a Masada? Where the pistol grip is attached permanently to the lower receiver, but also doesn't have a motor cage? You should still be able to install half the gearbox into the lower, and then insert the motor and put the motor plate on. It will just take you a bit longer. I have a shimming related question, kinda. 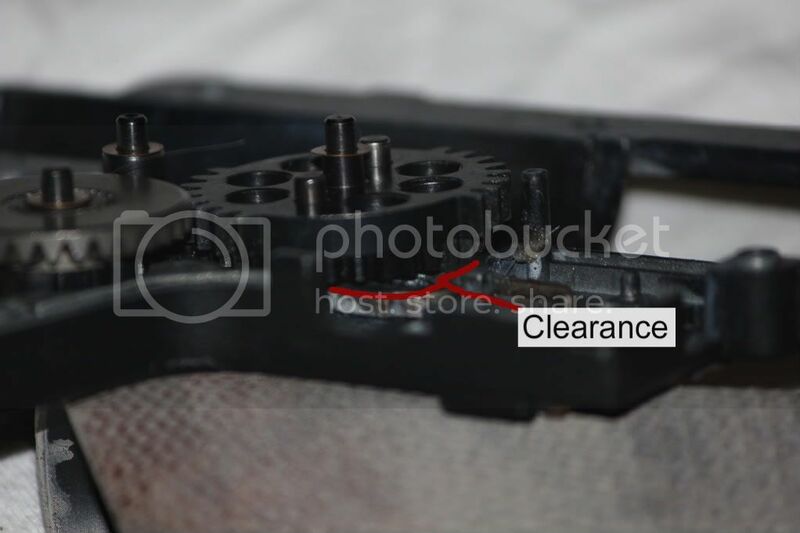 Should the bushings be flush with the inner surface of the gearbox? 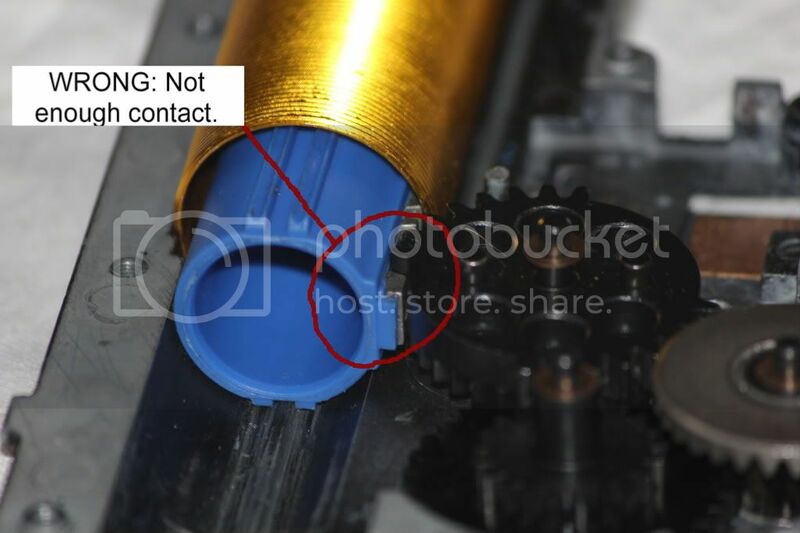 My bushing protrude a bit less than a millimeter into the gearbox. The reason I ask is because my sector gear seems to be suspiciously high.